In 1942, legions of US troops were leaving their homes to fight in faraway places overseas. At that time, the U.S. Mint was escalating coining activity to meet the demands of a growing wartime economy. More than 300 million dimes were produced that year, the most ever up to that point. Amid this frenzied pace, somehow two obverse Mercury Dime dies were hit by a hub dated 1941, followed by a second hit with a 1942 hub, causing a “2 over 1” error. The die with the more noticeable goof stayed at the Philadelphia Mint, where it made a small, unknown number of 1942/1 dimes. The other die was shipped to the Denver Mint, where it was placed into service. By March 1943, numismatists were writing about the 1942/1 overdate. Amazingly, the 1942/1-D error was not documented until 1960. Since their discoveries, Mercury Dime collectors have highly prized both 1942 overdates. As good as the 1942/1/-D Mercury Dime has been, it still rates below the average of the Rare Coin Values Index, which computes the composite percent change over time of a representational group of 87 rare US coins. 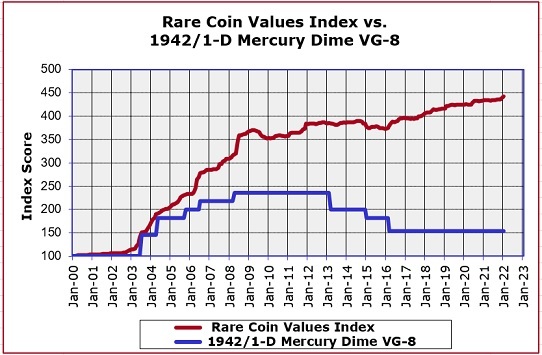 The blue line above charts the 1942/1-D Mercury Dime in VG-8 condition. The red line is the Index score. Both lines start in Year 2000 at a baseline score of 100. The objective of the Index is to approximate the strength and direction of the overall rare US coin market. The 1942/1-D Mercury Dime is one of the 87 coins that comprise the Index. The Index is updated monthly.